It was only going to be a matter of time before Nature caught up with the over-abundant use of herbicides. Particularly regretful is the advent of glyphosate — made famous by Monsanto with their product called Roundup — and the ensuing reliance of the United States’ agricultural industry on corn, soy bean and cotton seeds that the company genetically modified (GM) to resist Roundup. Studies began documenting weed resistance several years ago but the problem continues to mount, with The New York Times warning of the “Rise of the Superweeds” analogous to that of the ‘superbugs’ in medicine. About 22 US states and many millions of acres are apparently affected by the scourge, in particular a plant dubbed ‘Palmer pigweed’ that has developed the ability to thrive on glysophate. It seems Monsanto may have long ago anticipated the inevitable failure of the devious combo of genetically modified seeds plus Roundup. The company started experimenting with a ‘souped-up’ Roundup almost 10 years ago, to manage the problem of superweeds. Not that this is today any consolation to the farmers who are suffering from the expense of buying costly products that do not work, leaving them with lower crop yields. You call that a weed? Now let’s look at the vilified pigweed for a minute. First the name, ‘pigweed’, makes it an easy target for demonizing. Who could possibly appreciate something so base as ‘pig’ and ‘weed’ combined? Before we go any further, I would like to state the true and dignified name of pigweed: it is used to refer to several wild species of the genus Amarantus. The word comes from the Greek amarantos and means the “one that does not wither,” or “never-fading”. This plant family includes a wide variety of species, some of which are cultivated for their nutritious leaves (oft-compared to spinach), others for their grain (which is actually a pseudo grain or seed). Various wild species of amaranth are saddled with the label pigweed, particularly in North America, and several of those now feature on the list of the world’s weeds that have developed a resistance to glyphosate. The ‘never fading’ aspect therefore seems not just refer to the flower — which indeed keeps its deep reddish or rust color for a long time — but it also aptly applies to the sheer tenacity of the plant itself. It flourishes in a large variety of soils (from acidic to alkaline) and climates (from hot to cold); wild amaranth comes back without being planted; it grows in dry conditions; and some species thrive even in fields treated with glysophate — never fading. My own relationship with amaranth began around 1983. I wanted to make a special bread for my business, the Cloud Cliff bakery, at that time just a tiny venture in the Barrio of Santa Fe, New Mexico. 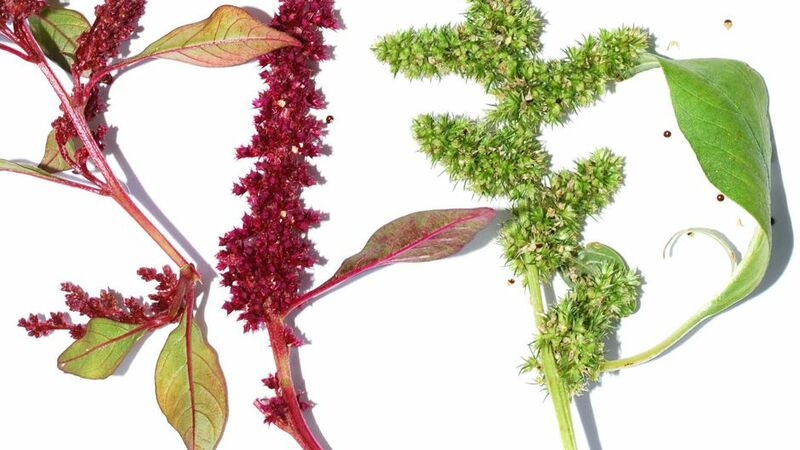 I was looking for something indigenous, hardy, and full of protein and rare nutrition (such as minerals and vitamins).Through the Rodale Institute, I stumbled upon the humble amaranth, long cultivated by many peoples around the globe, including ancient cultures like the Romans and the Aztecs who valued it in ritual and as a staple food. Amaranth seeds have a protein content of about 16 percent, more than other widely consumed cereals like conventional wheat, rice or maize, according to a book on the topic by the US National Research Council. Amaranth’s protein digestibility score is an impressive 90 percent, much higher than problematic foods such as soy, milk and wheat. Amaranth seeds contain 5 percent to 9 percent high-quality oil, again, much higher than the common grains. Found in the amaranth oil are tocotrienols — a relatively rare and very beneficial form of vitamin E — and squalene, another rare compound reported to have anti-cancer properties. The seeds have a protein content of about 16 percent, more than wheat, rice or maize and a digestibility score much higher than soy, milk and wheat. Vegetable varieties, though undervalued and looked down upon in some cultures, are also a nutritional powerhouse. There is even one species that is both a seed producer and a vegetable, Amaranthus cruentus. The seed is small and hard and it requires some processing to make it digestible. But, as with other grains, it can be prepared by using simple low-energy techniques. Cleaned, unprocessed seeds can simply be boiled briefly to make porridge. If toasted, the seeds taste better and can be eaten without further preparation. As is common in Mexico and Central America, amaranth can also be popped or puffed. I started exploring ways to bake with amaranth and settled on germinating the seed to soften it before adding it to bread. Experimental plots in New Mexico and Nebraska provided the amaranth grain. Cloud Cliff’s “Aztec amaranth bread” became my first commercial best seller, and people loved not only the taste, they enjoyed the health benefits as well. I have had many anecdotal comments on this over the years. So even now, after 26 years, I still bake with amaranth, and I highly respect it as “an ancient grain for our future”. Then, 26 years later the NY Times writes again about amaranth, but this time referring to it only as pigweed and describing it as the main invasive superweed. I believe this is an example of how language can manipulate perception. In other words: classifying amaranth as a superweed and ignoring its noble heritage and untapped potential is an ideological statement designed to make the proposed solution (reviving the toxic herbicide used in Agent Orange) seem rational. We need to look at this problem of invasive weeds very differently and luckily in this case we have a great opportunity to do so. Amaranth’s protein filled seed heads weigh up to two pounds and are relatively easily harvestable. Amaranth grows great where others can’t. In this age when we devote too much acreage to GM crops, Nature seems to be offering us a gift in the form of amaranth. The challenge should therefore be not to destroy it, but rather find ways of processing it into flour, bread, candy, and high quality green roughage and distributing it into the markets of affluent countries that currently rely on very resource-intensive protein (i.e., livestock), as well as sharing products and/or agricultural knowledge with nations where nutrition is scarce and people are hungry. Malnutrition is widespread in sub-Saharan Africa. Easy-to-grow nutrient rich foods, can boost nutrition and food security in communities that depend on subsistence agriculture. Amaranthus cruentus (the species that is both a seed and vegetable) is known as both easy-to-grow and nutritious. Further, it is among the highest-yielding leaf vegetables of the tropics. Amaranthus cruentus (the species that is both a seed and vegetable) is known as both easy-to-grow and nutritious and is among the highest-yielding leaf vegetables of the tropics. Thus you can see why I take such offence at the prevailing attitudes towards amaranth guised as pigweed. Rather than being torched with toxic agents, should not the wild plant relatives of such superfood warrant research and development? So I propose that we adjust our research, technology and diets and start a more wide-spread processing of the mighty amaranth into food. We potentially have millions of acres of it. Amaranth is a gift and we better learn how to use it. Rethinking a weed: the truth about amaranth by Willem Malten is licensed under a Creative Commons Attribution-NoDerivs 3.0 Unported License. Willem Malten is a baker, filmmaker and community activist. He owns and runs Cloud Cliff Bakery in Santa Fe, New Mexico. He is active in supporting the re-emergence of native and organic wheat farming and in 1993 helped establish the The Northern New Mexico Organic Wheat Project. Malten directed Cry at the End of the 20th Century, a documentary featuring Amy Goodman, Greg Mello and others, about nuclear weapons and civil disobedience. With the Shipibo Konibo tribe in the rainforest of Peru, Malten directed a movie about a coming of age ceremony for girls, for which Correo Aereo composed the original score and Gene Hackman narrated. He also produced a series of short movies on beekeeping, adobe, algae, solar, and sustainability for Ecoversity TV. Malten has a masters in anthropology from the University of Amsterdam in his native Netherlands. He is a long-term director of Los Alamos Study Group and writes a regular blog called Vortex Politico. Thanks for a great read Willem. It seems that our treatment of amaranth, or most weeds (because I assume introduced plant pests can do serious damage to more established species) reflects a common one dimensional view of nature held by governments and corporations – that we can simply pick and choose what we like, and kill the rest. The good news is that closed-loop polycultural food systems that embrace weeds, insects, manure and other demonised aspects of nature can and do work. But is humanity willing to invest in labour, and not just capital, in fulfilling our most important task which is to feed the world? Many people are starting to turn to growing/providing their own food now, it seems to be a second Back To The Land movement almost. I retired 7 years ago to a small farming community in TN mountains. We are in the process of learning how to grow all our own food. What I have found is that there is a wondrous beauty and joy to working on one’s own land. The longer I’m here, the more amazed I am at how much joy I derive from gathering herbs, wild amaranth, gardening, working around the property doing various “chores”. The spiritual gifts it has brought have been tremendous, I love working close to the earth, with all the wildlife and critters. It’s peaceful and tranquil. I don’t mind doing any of this work. I know many others who feel the same way. It just doesn’t seem like work, it’s more like pursuing really fun interests. And we get to feel SO much better, eating healthy unprocessed, nutrient-rich food. I highly recommend this lifestyle to anyone who’s interested. What a great thing to discover! Long live amaranth! And how ironic (and sadly predictable) that what our culture debases, marginalizes and demonizes too often (always?) seems to be the missing “seed” of our future wholeness? Carl Jung long ago had the insight that what we reject ends up residing in our shadow, and only when we make our shadow conscious can we unleash the tremendous reserves of power previously used to suppress it. Willem, someday I’d love to taste your Aztec Amaranth Bread. Thanks for this inspiration! Thank you Willem! My suspicions this summer of the wild amaranth that began to grow all around the garden here at (The Ranch) generated a rather wild excitement in me that there was something here that needed looking into. One day a ‘local’ said to me, “you know when I was young this stuff was at all our meals”, this Person told me that this weed, that I was pulling up like crazy and cussing all the time was a type of Amaranth and if I harvested the leaves could be added to almost any dish creating a uniquely nutritious delight. This Person was right. What an informative article! I am from the Niagara Region in Canada (Niagara Falls area) and have worked with “Wells of Hope” a locally founded charity working to serve the poor of Guatemala. Before my last visit in April, I was trying to find Amaranth seeds to take and grow in Guatemala, but could find no suppliers. The people of the mountains of the Jalapa Region really only know and can afford to grow corn. My hope was that amaranth would provide a more nutritious diet and could be made into their staple tortilla. Hi Dave. Nice to hear about your work & sorry to hear your plan was dashed. I guess to find Amaranth seeds you’d likely need to go the grassroots rather than commercial supplier route. Let’s see if Willem has any advice for you (if you’re still looking). This is very interesting and I know your post is >6 years old. During my first visit to Guatemala almost 7 years ago, one of the locals actually walked me through a field of amaranth and showed my how they extract the seeds for cooking. As a farmer, I wish you would be extremely cautious about introducing foreign and extremely invasive plants into areas where they don’t occur naturally. Well-meaning people introducing “a promising new forage plant” is how we got such things as Kudzu and Johnsongrass here. And crabgrass, if you believe one article I read recently. Just wanted to let you know, amaranth is a very popular leafy vegetable eaten in India. Our family has been eating it since generations. The leaves arae nutritious and amaranth seeds too are used to make sweetmeats and flour for making chappatis and dosas! … and the tender stem are often cooked as a broth or curry. From an ecological point of view, there is no such thing as a ‘weed’. There are just different plant species that compete amongst themselves and with other species. We need to accept that our crop monocultures are not natural. We need to farm within Nature, not outside it. Its great reading your article conscietising people of the value of Amaranth . This plant seems to have great nutritional value that maintains peoples health. Farmers in our country Tanzania have started cultivating amaranth but they are now facing a problem they dont know where to sell the grains. Kindly connect them to the buyers so that they continue cultivating it . Can the team at OurWorld 2.0 encourage the author of this article to contribute more often to this beautiful website? Hi Elizabeth. Thanks very much and yes, we will certainly pass on your sentiment (which I share!). If ever you’re in New Mexico, please drop into his bakery and tell him in person, as well as indulging yourself (on my behalf) in his edible art. The genus Amaranthus contains numerous species, and these species are all considerably different from one another. Some species have characteristics (some of which you named above, such as large seedheads that produce seeds that are nutritous and easily harvestable) that make them suitable for food. However, the particular species (Amaranthus palmeri) that has developed resistance to glyphosate posesses none of these traits. It produces abundant seed, but these seed are tiny and not held in a seed head that is easily harvestable. They may be of some value for nutrition, but the plant does not produce them efficiently enough for it to be a valuable food crop. Palmer pigweed puts most of its resources into forming a large, highly lignified (think shrubbery stems or something like that) stem and leaves. Another characteristic of Amaranthus palmeri is that it is monoecious. This means that there are male plants and female plants. The female plants are covered in thorns. You cannot eat something that is covered in thorns. Also, I have seen these growing in a cow pasture, and the cows will not eat them. If the cows won’t eat them, you can bet they are not good for humans to eat. I would suggest that the author of this article, along with all of you who have posted here, do a little more research on this subject. If you still think you want to find a use for this plant, be my guest. Plant them in your garden and watch them take it over. Then try to get rid of them when you see first hand how they out-compete anything else you try to plant. One more thing. Palmer pigweeds do not “thrive” on glyphosate. Nothing “thrives” on glyphosate herbicide. There is nothing in glyphosate that helps any plant grow better. Glyphosate-resistant palmer pigweeds simply have developed a mechanism that allows them to be unaffected by the herbicide. They are aggressive growers and are highly drought and heat tolerant, so they will thrive in a south Georgia cotton field in the summertime regardless of whether glyphosate is applied or not. He never acknowledged that there was more than one species of Amaranthus. To the average person that knows nothing about this subject, it looks like we are attempting to destroy a plant that could solve the world’s food problems, and that is not the case at all. Additionally, no “toxic agents” are being advocated as a method for controlling this weed. NO ONE has proposed bringing Agent Orange back. It is extremely unfair of the author to use such a sensational and controversial term to describe a herbicide that has been around for sixty years and has in all that time not been proven dangerous enough to have its registration pulled by the EPA. It might have been an ingredient in Agent Orange, but I imagine water and detergent were as well (detergent is often used in herbicides to help the spray stick to the leaves). Should we be concerned when we wash clothes or run the dishwasher? I think not. This plant family includes a wide variety of species, some of which are cultivated for their nutritious leaves (oft-compared to spinach), others for their grain (which is actually a pseudo grain or seed). Various wild species of amaranth are saddled with the label pigweed, particularly in North America, and several of those now feature on the list of the world’s weeds that have developed a resistance to glyphosate. (Though your comment did make me realize we needed to correct the link on “variety of species” which now takes you to the page showing all species, not the individual fiche for Palmer’s.) Further, he uses species in various places to specify the vegetable/seed type. Nonetheless, I do understand your feelings of frustration and injustice at blanket criticisms. Most of us would/do feel much better about the food we eat if/when we knew it came from farmers such as you & your neighbors. But in a world where concentration of production is a reality, can you not empathize with the concerns of non-farming families when registration of herbicides, in say the US, is allowed when studies show “that they can be used without posing unreasonable risks to people or the environment” (EPA). Do people not have the right to doubt those who decided what is “reasonable”? What of long term multiple source exposure, the impacts of which are not yet understood? So can you clarify? Is the seed from Palmer Amaranth edible? You are correct in that cattle will not eat it. But pigs love the stuff. In fact, my pigs would eat every leaf off of “red-root pig weed”, or palmer amaranth. And they thrived off the stuff. The leaves are safe to eat when they are young, as far as I know. But who wants to go picking off a plant that has them thorns? Thank you. I’m writing a book on the so-called “invasive species,” so many of them, both in the plant and animal kingdoms, are edible. This piece is a good resource for me. 2,4-D and Agent Orange are two very different substances. 2,4-D was a component of Agent Orange, along with another phenoxy, 2,4,5-T. Researchers have found that it was 2,4,5-T that was the compound of concern in Agent Orange for dioxin contamination. As a result, 2,4,5-T was discontinued from use in Canada and other countries around the world more than 25 years ago (production and registration) while 2,4-D continues to be the one of the most trusted and widely used herbicides in the world. This information is available to those that take the time to do the research instead of using “hear say” in an attempt to give foundation to their article. Please look into things for yourself and use reliable sources. Yes, Amaranthus species could have potential as an agronomic crop, but in recent years it has been a threat to agricultural crops that most of the U.S. and the world have grown to love and need to survive. Changing that overnight or in a few years is not feasible. Research is being conducted into the usefulness of Amaranthus as an agronomic crop and its oil content. Current corn, soybean, rice, peanut, cotton etc. all came from similar primitive plants, we (humans) just selected the best plants/seeds over thousands of years to fit our purpose. So, it takes time. Be patient and stop bashing science. New technologies feed the world, and without them even more people would be hungry. Is Amaranthus going to feed most of the population in 2050? I doubt it, unless it is genetically engineered to grow less stalk and leaves and about 1,000 times larger seed, but then most people wouldn’t want it because it would be a GMO. A weed is simply a plant out of place, i.e., a corn plant in a cotton field or a peanut plant in a corn field. Some species tend to fend better for themselves in a competitive environment as expected. In this case, a C4 plant (Amaranthus), which grows more quickly without photorespiration occurring and having a high water-use efficiency, is in competition with most of our C3 crops, that are slower growing plants, so that makes Amaranthus species a “hard to control” weed in most current crops, especially with some species like Palmer amaranth being selected unintentionally to have glyphosate herbicide resistance. Herbicide resistant weeds have emerged due to our forced natural selection from current human monoculture crops, as in, spraying the same herbicides for many years in the same fields selected the weeds that could survive that environment. Then those weeds become harder to control as the weed population expanded to other areas. Fortunately, scientists and growers are smart, and have developed alternative weed management programs to deal with most resistant weed problems. Best management practices involve actively learning new and more sustainable ways of providing the worlds food in the safest ways possible. On a final note, most of us take for granted that we can sit back and discuss what we think is right or wrong, but in the big picture almost everyone benefits from current agricultural advances, and wouldn’t have it so easy or have the luxury of a relatively inexpensive meal without researchers, growers, and large agricultural companies working together to provide our food. Dear Brian. You seem to have not quite absorbed the gist of the essay you are criticizing, which is essentially that our wholesale pursuit of monocrop agriculture has led us to make some mistakes the dire consequences of which become better understood over time. And while the author waxes philosophical perhaps, and certainly has an opinion that is opposite of yours, he does not twist facts. Further, you claim that he should do research, yet you might be wanting in that department yourself. You claim that it is a completely safe product? However, it has become increasingly obvious that proper research into the massive number of chemicals used by all manner of industries worldwide has been seriously wanting. In fact, ongoing research on 2,4-D has placed it among those suspected as endocrine disrupting. Of course you can find industry-backed studies that say the exact opposite (here is a typical example: http://informahealthcare.com/doi/abs/10.3109/10408444.2012.710576 ) but people certainly have a right to mistrust powerful industries that are not properly regulated. In fact, even the US EPA knows that “smart” is possibly not as smart as you seem to believe. Here are some extracts from a document of theirs – http://www.epa.gov/oppsrrd1/REDs/24d_red.pdf – that might shake your faith. Let’s hope those tests, when finally done, prove you right. Because our health and that of the planet we depend on to sustain us, sure could use a break. I was just writing about amaranth in my yard (tesli.org) and I wanted to know more about it when I stumbled onto your article. Thank you! Very nice information. I was not aware that the grain from the amaranth weed in my yard could be used. I thought there was probably some commercial variety for food production. Great to hear about it becoming a superweed. The bees certainly think it is super. Any tips for how to harvest and process the grain. All I remember from last year was the plants get awful spiking once they dry up. Thanks again! Very glad to be of assistance, Dorena! The article above was written by an Anthropology major who seems to be pulling information on both agriculture and chemistry out of his nether regions. Here are just the zingers that really stand out to me. Yes, if by “thrive” you mean, only have 80% of the seedlings die, yes, it thrives. 20% with a plant that aggressively seeds like “pigweed” is still 20% a lot, though. Nope. All herbicides that are selective can engender resistance and nobody involved in chemistry is going to call it “souped-up Roundup”. Completely different class of herbicide. 2,4-D is NOT banned in any of those countries. An activist push had them temporarily delisted and they were immediately reinstated when the organizations involved concluded there was insufficient science to support the claims against it. Also, 2,4-D is a component of Agent Orange like SUGAR is a component of cyanide. Yeah, apparently. If he’d bothered to walk out his door and taste some (it’s a nearly omni-present pioneer plant in most human disturbed environments in the US) he’d have found that the weedy forms vary between “barely edible” and “burning plastic” in taste. Sadly that “book” used heavily outdated information. If he’d bothered to do any research he’d have found everyone switched to Protein Digestibility Corrected Amino Acid Score roughly 20 YEARS ago. Under that more accurate test it’s closer to half the value of egg whites or most meats. Interestingly enough soy protein (not isolate) ends up being a complete protein as far as PDCAAS is concerned as well. The king however, is mushrooms. Within 2% of eggwhites in PDCAAS. Even beats beef. There’s more, but I’ve gotta go pickle fruit. Thanks for sharing your well-written article. Amaranth isn’t commonly called Pigweed in the UK, but it isn’t commonly grown, either. it’s not an agricultural crop, and it’s an unusual garden/allotment crop, although we have several ethnic minorities for whom it is important. I would like to see it grown more often!